Every so often, someone I don't know will message me on LinkedIn asking for advice on interviewing for a sales position. 1) You’re an A-player? Show it. When it comes time to interview, everyone is a Top 10% sales rep. Short of seeing your W2, the hiring manager has no way to confirm. Don't just tell them how great you are, show them. Are you at the top of a leaderboard, a whiteboard, big screen, or dashboard in your CRM? Take your phone and grab a photo. Won an award? Take a photo of that, too. Print out these pics or send them over to the hiring manager. Seeing is believing. 2) You’re a born prospector? Confirm it. Giving sales candidates assessments is common. What is uncommon is for a candidate to hand over an assessment they've already taken. If you're interviewing for an outbound prospecting role, hand the hiring manager proof that you're wired for success in that position. As an example, I recently took a sales talent questionnaire from SalesGenomix (see my profile below). Do some research, find an appropriate assessment, take it and share the results. Everyone says they're a great fit. Bring 3rd party validation. 3) You know how to prospect and/or sell? Prove it. 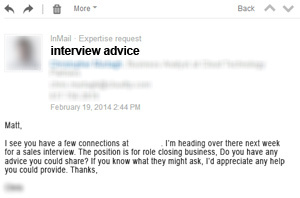 It's difficult for hiring managers to get a read on 'how' you sell. "Tell me about a time..." behavior-based questions are trying to get at this. Prove you know how to sell. Prepare a 5-slide / 5-minute overview of a recent win (when you created a new opportunity or closed a deal). There are two things at play here. First, can you present? Can you tell a clear & compelling story in five minutes? Second, how did you execute? Can you set the stage, introduce the characters, outline your actions, reveal the turning point, and analyze what worked in the situation? You can deliver this over the phone or in person. But make sure this isn't a monologue. Paint the picture, engage the audience, and (above all) don't forget to close. Show, don’t tell. If you want the job, you need to execute an effective sales call. Being reactive is what everyone is doing. Hiring Managers, what have you had candidates do to rise above the fold?